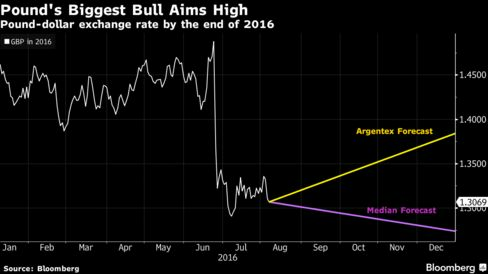 The pound’s biggest bull is keeping the faith. John Goldie, a foreign-exchange dealer at currency advisory company Argentex LLP in London, is maintaining his bullish year-end pound forecast even after the Bank of England this week announced additional stimulus measures and a stronger-than forecast U.S. jobs report revived speculation that the Federal Reserve will increase interest rates by December. Goldie sees sterling climbing to $1.38 by year-end — almost 9 percent higher than the $1.27 median estimate of analysts in a Bloomberg survey — making him the biggest bull in an otherwise bearish market. While the pound weakened after the BOE’s decision, Goldie based his estimate on a better-than-expected economic performance for the U.K. by the end of the year, and no more than one increase in U.S. rates. Goldie’s forecast may be symptomatic of the uncertainty following the U.K.’s decision to leave the European Union in June. On Aug. 4, the BOE cut interest rates for the first time in seven years, by 25 basis points to 0.25 percent, and raised its asset-purchase target for the first time in four years by 60 billion pounds ($78 billion) to 435 billion pounds, in order to support the economy. The pound slid 1.2 percent this week to $1.3069 as of 5 p.m. Friday in London, having tumbled 1.6 percent on the day of the BOE announcement. That’s still higher than the 31-year low of $1.2798 reached on July 6. Sterling dropped for a third week versus the euro, losing 0.4 percent to 84.78 pence. Goldie’s sanguine view about the economy is supported by Citigroup Inc.’s U.K. Economic Surprise Index. While some reports suggested Brexit is taking its toll on consumer confidence and business activity, Citi’s index, which measures the strength of key data relative to analyst expectations, rose to the highest level since September 2013 this week. A positive reading shows that data releases were stronger than economists expected.